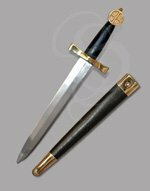 Medieval Nobel's Dagger - This dagger has some scratches on the scabbard and the handle. There are (2) left, in closeout and once sold will be discontinued. 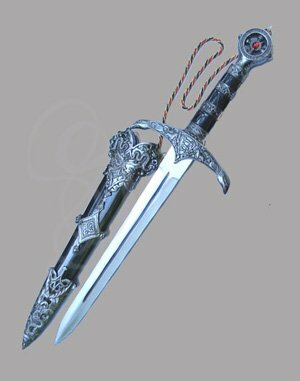 Medieval Lord's Dagger. 17 5/8" overall. 10 3/4" stainless blade with blood groove. Cast metal handle, guard and pommel. Pommel has simulated red ruby centerpiece with "Earl of Huntington" engraved around circle. 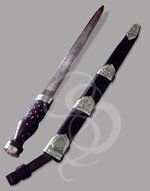 Black wooden scabbard with cast metal fittings. 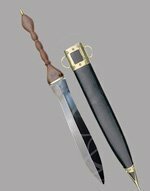 Black, gold and red chain connects dagger to scabbard. 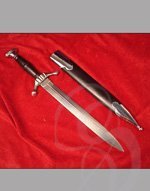 This is a fantastic costume dagger for the price! I got this dagger as a Christmas present, and not only did they love it, but they're family also loved it. The box it came in had red foam that looked nice and the collectors card with stats for the dagger was the best thing ever. I had it detailed with his initials,and it looked clean, and super smooth. Thank you.